We've forced ourselves to have a couple of days off here at GCHQ. Well our bodies have anyway as we've been beavering away for the last 3 weeks pretty non stop, doing dance samples for quite a large (and top secret - okay not really but we can't tell you) project. The result is pretty much bad tempers, yawns and aching ears - none of which is good for a creative atmosphere in the studio. Sooo a few days off seems in order before we start on the next commission in the que. 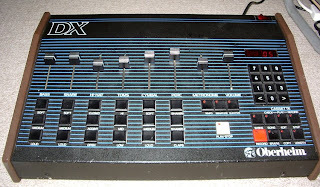 To raise spirits ( and make the drum machine geek in all of us here at the lab wet 'emselves) we've just got hold of an Oberheim DX drum machine. A true child of the 80's and smaller brother to the mighty DMX, the DX is big, brash and yet very funky. It uses gritty samples written to Eprom chips and is built like a brick privy. Almost as large is the us/uk step down transformer needed to run it - good ol' Maplins. We've got a downloaded manual for the V2 of this machine, but ours is the V1 (pre midi) model - so if anyone out there has a copy of that manual get in touch. Because (as you may have noticed) we don't really like to do things by halves, we also got hold of a Jomox airbase 99. This is a now discontinued, rackmount, totally analog (save lo-fi samples of the clap, and hats) drum synth - really a great 909 clone. Although we haven't really had the time to plumb it's depths yet, it has some heavy punch and a huge kick drum. So at least we are rhythmically content.